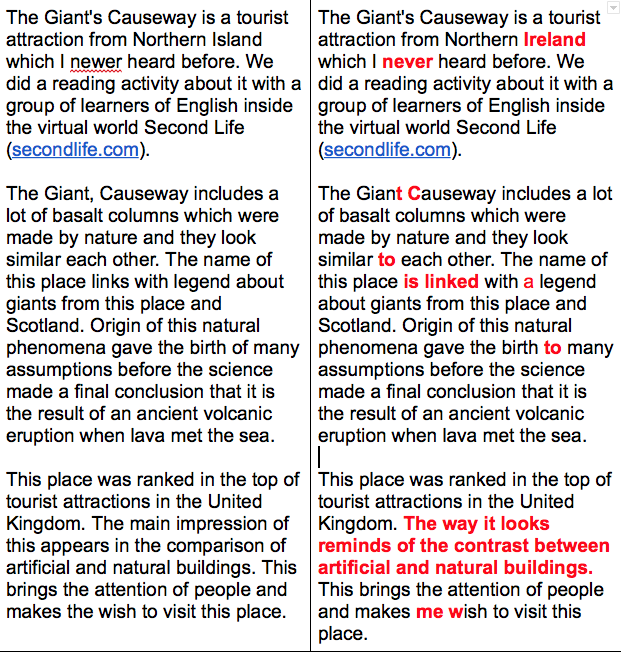 The Giant's Causeway is a tourist attraction from Northern Ireland which I never heard before. We did a reading activity about it with a group of learners of English inside the virtual world Second Life (secondlife.com). The Giant Causeway includes a lot of basalt columns which were made by nature and they look similar to each other. The name of this place is linked with a legend about giants from this place and Scotland. Origin of this natural phenomena gave the birth to many assumptions before the science made a final conclusion that it is the result of an ancient volcanic eruption when lava met the sea. An area of about 40,000 interlocking basalt columns was declared a World Heritage Site by UNESCO and a national nature reserve of Northern Ireland. The tops of the columns form stepping stones that lead from the cliff foot and disappear under the sea. Most of the columns are hexagonal, although there are also some with four, five, seven or eight sides. This place was ranked in the top of tourist attractions in the United Kingdom. The way it looks reminds of the contrast between artificial and natural buildings. This brings the attention of people and makes me wish to visit this place. This story was written after Marga's class at the Reading Circle in Cypris Chat. Cypris Chat is a not-for-profit virtual world English language learning community located in a virtual world called "Second Life" created by Linden Lab. Cypris Chat is not a school, however, we offer “practice times” in the form of organized lessons, discussions, chats, events, and activities. Come see for yourself just how exciting this new way of learning can be. Join Second Life at http://secondlife.com and then teleport to Cypris Village. This story was corrected by the teacher Alina during the class in the online language school albert-learning.com. The information about corrections was kept here.